was not consistent with her young 16 years. Whether you followed her career or not, were a fan or not, the doc is worth a screening. Director Asif Kapadia makes incredible use of found footage,from her emerging teen years through to her untimely death from alcohol poisoning in July, 2011 at age 27. He splices it all together to unfold a truly tragic tale, told basically by Amy herself. She shows us her humor, her gifts, her bleeding heart, her tortured soul, her addictions and her downfall, with the help of the media who ultimately brutalized and consumed her alive. develops a poor reputation, internationally, as a professional. Tours are cancelled and she is hospitalized. The viewer sees little girl lost, being swallowed up by the demands of her profession; to write, to record, to produce money makers, to tour and to respond to the demands of her fans after breakout album "Back to Black" tops the charts in Britain and across the pond. She is loved and adored and is slowly dying. Her record eventually becomes the top selling album in Britain for the 21st century and what little is left of her begins to disappear for good. The doc attempts to paint a true portrait of the artist, with her giant bee hive hair,her filthy unrestrained mouth, her tortured soul, her brilliant creative abilities and ultimately we see the very heart of who she was. Most will be haunted by her trademark made-up, large expressive eyes, long after the film is over. Most will also want to reach out into the screen and save her, if only to hear more of what she would have produced over the next 50 years of her life. Her bio is heart-breakingly short. 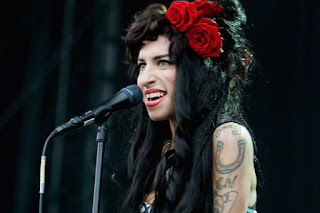 After screening for Midnight Screenings at Cannes, and heading towards impending July release dates, "Amy" is emerging to be one of the best documentaries of 2015.